Best Valentine’s Day present EVAH! around and around until morning…. I’m so glad he didn’t poach me a heart-shaped egg for breakfast! Kris got me a 1967 Spirograph for Valentine’s Day. It’s only missing 2 gears. He knew that I have wanted one since I was 7. I was so thrilled to finally have a set, I couldn’t stop drawing them! Naturally, I had to grab my current embroidery project and draw one straight onto the fabric, stitch it up before the night was over. I would like to know what pen you used to make the pattern. Im trying to make this. Tyia. You can buy a Spirograph at teacher stores and Cabella’s. Probably on Amazon, too. I saw 3 different ones, increasing in price. 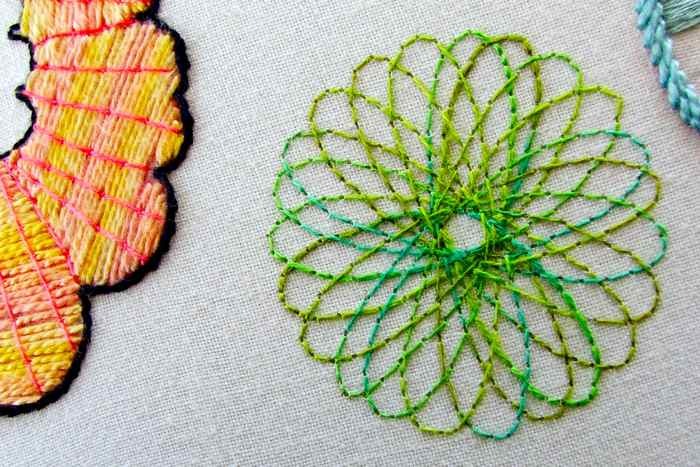 I have been looking at different fractal patterns to stitch and couldn’t help think that my old spirograph game (a favorite) would be a good source for patterns. Before starting I decided to do a web search and found your great site. The photos of your work are great. Excellent choice of colors and the patterns are so pleasing to the eye. Super spirograph was fun too! 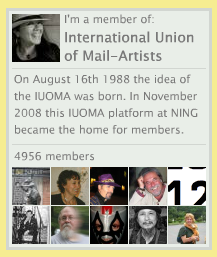 Thanks for posting, made my day! Fantastic!!! great translation from ink to stitch. now i totally want one for myself. …and!, the pens you used, i can’t find them anywhere. my favorite. can you remind me of the brand and let me know where you got them? pretty please? This is so colorful and bright. I really think using it for embroidery is a inspiration for all of us. 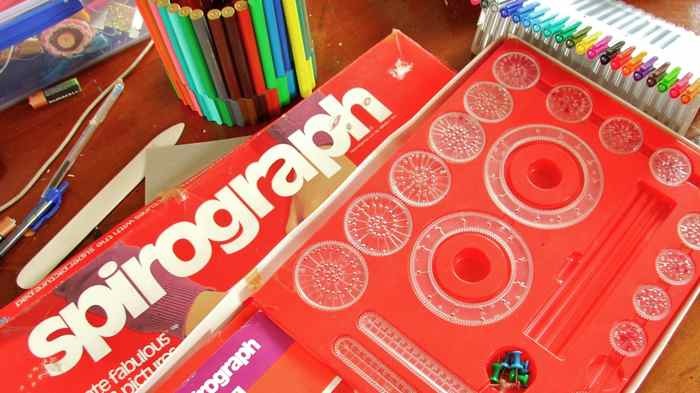 Now I will garage sale looking for s spirograph!!!! I recently acquired those Barbie “Fashion Plates” from a yard sale. You know, where you arrange the head, torso, and legs, then do a crayon rubbing over it? Now I must have a Spirograph! This is fun and genius! Maybe I’ll go stitch up some fashion plates . . . not as awesome as spiros, but thanks for the fresh look and the inspiration! I love it and never thought of that.. 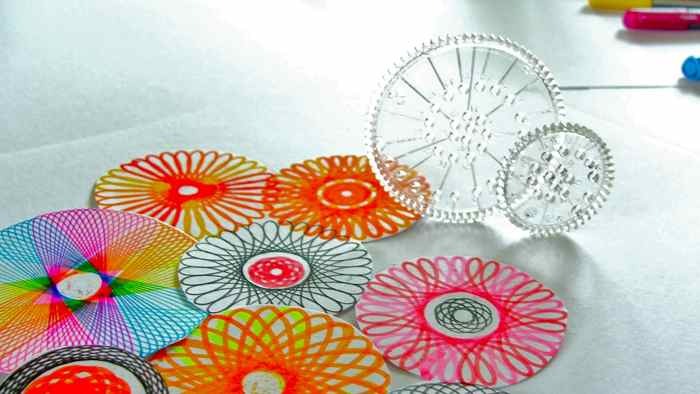 I used to love the Spirograph! Aunt give away to Goodwill without discuss with me! I pouted.. I am looking for Amazon.. I found one of them are used box which it cost more than new one? 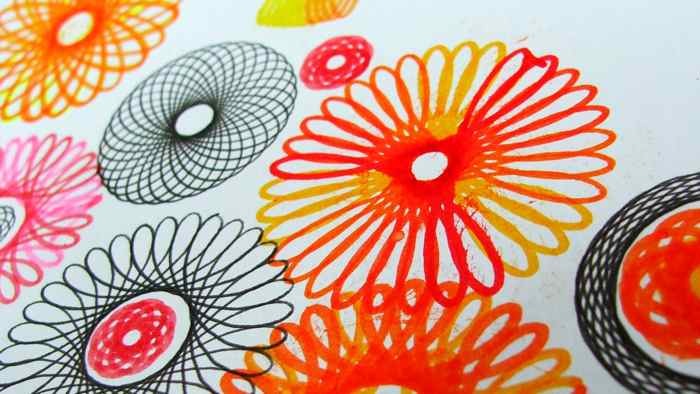 I loved Spirograph when I was a kid in the 60’s. Still have mine too. How cute! That looks so fun! how cool to get one in such good nik. ::: squeal::: I knew when I saw the first picture in my Google Reader that it was a Spirograph!!! So much fun . . . and I love that you used it for embroidery inspiration =).